Locals in Venice are claiming that the Carnival Sunshine sailed too close to the shore when sailing by Riva Sette Martiri, to give guests a view of the famous Piazza San Marco. The above photo via the DailyMail shows how close the ship came. With reference to media reports of an alleged “salute” made yesterday by the cruise ship Carnival Sunshine in Venice, Carnival reiterates that those accusations are unfounded. The passage through the Venice Lagoon occurred in full compliance with navigational regulations and well within the accepted parameters for distance from shore. The Carnival Sunshine passed more than 70 meters from Riva dei Sette Martiri on the planned route. The distance from shore has been confirmed by the Coast Guard, the local pilot association and Carnival Cruise Lines. The story gets even more confusing now that Carnival’s Chairman of the Board, Micky Airson, is involved. 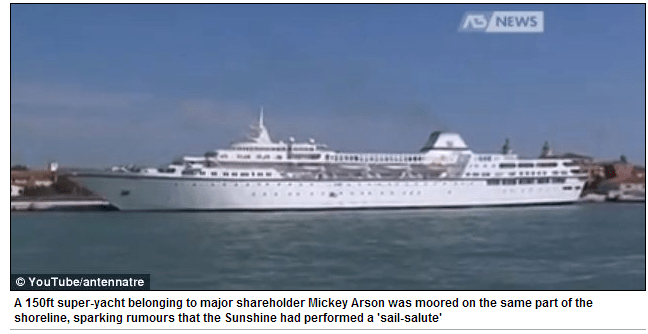 Several news outlets have reported that the Sunshine sailed too close to the shore, a.k.a a ‘salute’ like the Costa Concordia’s infamous one, because Mr. Arison was there on his yacht which happened to be moored close by. To all my Venetian friends. Capt, Pilot, & Coast Guard with GPS evidence agree that the ship made a normal & safe transit thru the lagoon. Same article in the Daily Mail has the little gem of investigative reporting. Pretty sure that ship is just a ‘tiny’ bit larger than 150ft. Its also neither a yacht.